Cataracts - body, What Happens When People Get Cataracts? Cataracts develop when the lens of the eye becomes cloudy. They usually impair vision and sometimes occur as people get older. Many people who live to an old age will develop cataracts, often without noticing the effects until they are past age 70. For some, it might mean only a slight change in vision. Others, however, will find they need surgery to remove the cloudy lens. * retina lines the inner surface of the back of the eyeball, It contains millions of light-sensitive cells that change light into nerve signals that the brain can interpret. A cataract results when the clear lens in the eye becomes cloudy. Like frost on a window, the cataract makes it more difficult to see clearly. The reason is that the light passing through the cloudy lens is distorted before it reaches the visual receptors in the retina * at the inside rear of the eyeball. Cataracts develop slowly, causing the eye's clear lens to become cloudy. Cataracts can be removed surgically. What Happens When People Get Cataracts? Researchers believe that cataracts develop because the proteins in the eye change as people age. The changes cause the lens to become cloudy. Other factors, such as smoking, poor nutrition, eye injury, exposure to excessive sunlight, and certain medical conditions such as diabetes, also may be factors that put people at higher risk of developing cataracts. 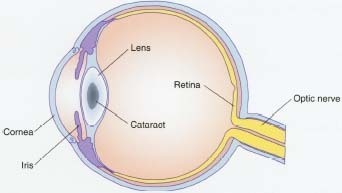 Cataracts develop slowly. At first, people notice difficulty reading the newspaper, or they experience blurry vision. The eyes become more sensitive to light, and seeing at night becomes especially difficult. People with cataracts often say they feel they have a film over their eyes, as if they are looking through a piece of gauze. For a short time, the condition actually may benefit some people who always had trouble seeing things that are near them, such as the words on this page. The cloudiness of a cataract changes how light is focused and temporarily results in better vision for such people. They may find themselves able to read for the first time without eyeglasses, a condition sometimes called "second sight." As the cataracts worsen, however, eventually these people will experience increasing visual difficulties. How Do Doctors Diagnose and Treat Cataracts? An ophthalmologist's * eye exam can detect a cataract and follow its progress. When cataracts are detected, the doctor can evaluate the symptoms and decide on the best course of treatment. Many people can live with the condition untreated. For others, surgery may be recommended to remove the cloudy lens and to replace it with a clear artificial lens that is smaller in size than a dime. Cataract surgery improves vision in 90 to 95 percent of the people who have it. It is one of the most common operations, with more than 1 million performed each year. Surgery generally is done when the lens has become so opaque or cloudy that reading, driving, or watching television become major problems. Some studies suggest that vitamins C and E may lower the likelihood of developing cataracts. That is because these vitamins appear to reduce damage to the proteins that are linked to the development of cataracts. Also, using sunglasses that block ultraviolet light may lower a person's risk of developing cataracts, because studies strongly suggest that sunlight plays a role in their development. Avoiding cataracts is another important reason to avoid smoking, as smokers appear to have an increased risk of developing cataracts. The U.S. National Eye Institute posts a fact sheet about cataracts at its website.